This is a final guest-post from Jonathan Ladd. We appreciate his contributions. His other posts are here and here. 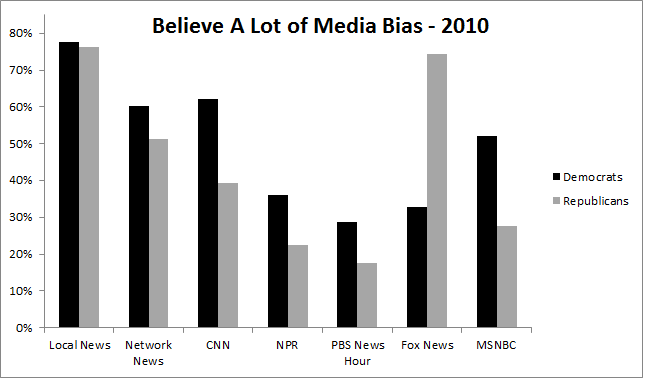 In my final post on media distrust, I would like to explore the connection between attitudes toward the media and partisan self-selection of news outlets. In the past 20 years, the number of news sources that are identified in elite discourse and mass opinion with particular ideological perspectives has growth. This trend has been driven both by new outlets entering the news marketplace and by existing outlets acquiring more of a partisan reputation and audience. As a consequence, Democrats and Republicans increasingly tend to choose different media sources, with each side more likely to get news from sources with reputations for favoring them (for example, see here and here). One can see this trend over the most recent full decade by comparing the “Media Consumption Surveys” conducted by the Pew Center for the People and the Press in 2000 and 2010. These two surveys use the same format to ask respondents how often they use a series of different media sources. They each also ask about trust in the media. Unfortunately, they ask using different questions, meaning that we should be cautious about whether they are comparable. However, in my book, I find that media trust survey responses are unusually robust to sometimes major differences in question wording. Based on that, I suspect that these two different questions probing media trust probably separate those who trust more from those who trust less in roughly similar ways. 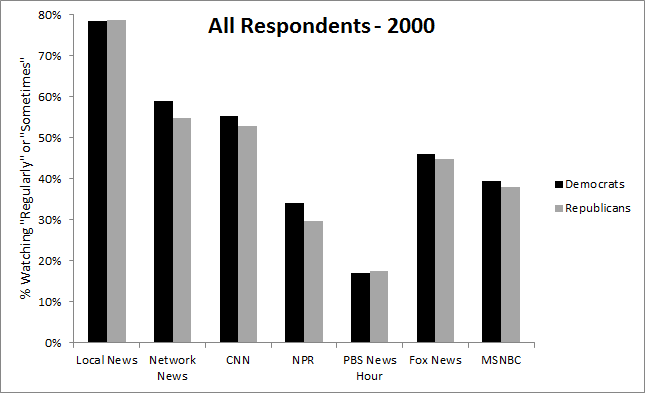 Below are three charts showing what percentage of Democrats and Republicans watched various prominent news sources “regularly” or “sometimes” in 2000. The first chart displays this for all respondents. 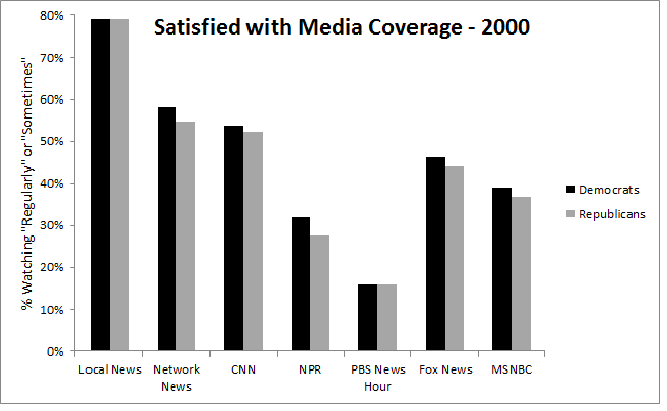 And the bottom two charts split the respondents according to whether they were satisfied with “the media’s coverage of news about political figures and events in Washington.” There is actually very little evidence here of people choosing news outlets based on their partisanship in 2000. 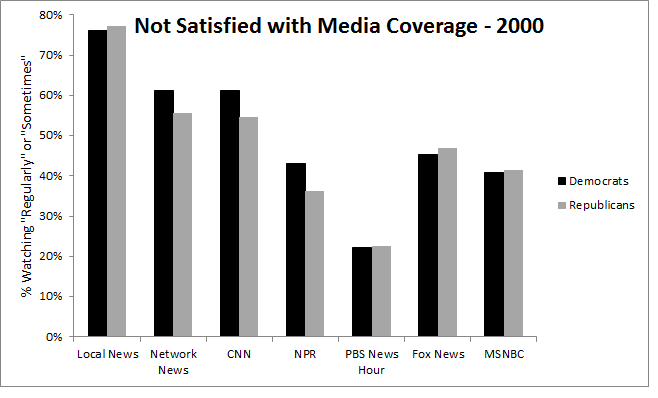 This is true largely regardless of whether people were satisfied with the media. Among those dissatisfied with the media, Democrats were a bit more likely to use network news, CNN, and NPR, but these differences are quite small compared to what would come later. 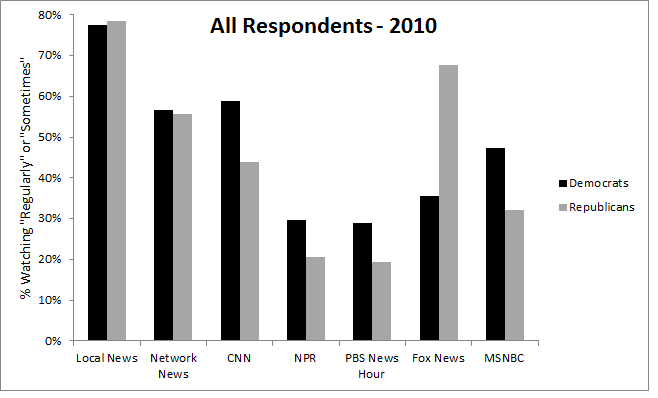 The next three charts show the percentage of partisans watching the same set of sources in 2010. The first shows results for all respondents. 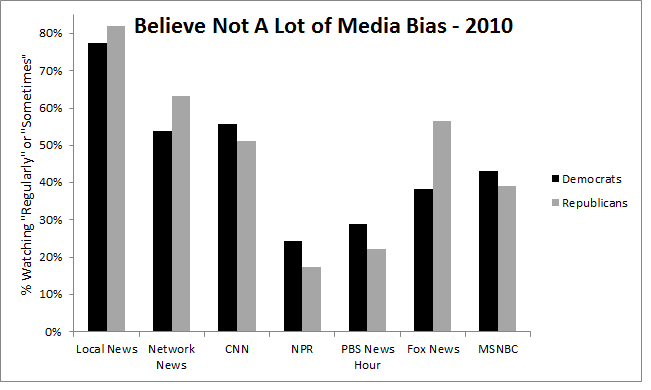 There is clearly a stronger relationship between partisanship and news choices than there was a decade earlier. But there is more going on here in the difference between those who trust the media more and less. The bottom two charts divide the sample between those who said they thought there was “a lot” of “political bias” in “news coverage” and those who did not. Dividing people this way reveals that those who distrust the media are a good deal more likely to choose their news consumption in ways that confirm their predispositions. Moving from those who do not perceive a lot of media bias to those who do, Republicans go from being 9 percentage points more likely to watch network news to Democrats being 9 percentage points more likely to watch. The gap between Democrats and Republicans in their CNN viewership grows from 5 to 22 percentage points. The partisan gap in NPR listenership grows from 5 to 13 percentage points. The gap in PBS News Hour viewership grows from 7 to 13 percentage points. And the partisan gap in MSNBC viewership grows from 4 to 24 points. Among those who do not perceive a lot of bias, 56 percent of Republicans and 38 percent of Democrats watch Fox at least sometimes, a 19 percentage point gap. But among those who perceive a lot of overall media bias, 75 percent of Republicans and 33 percent of Democrats watch Fox, a 42 point gap. To summarize, people who distrust the institutional media learn about the political world differently. They are more likely to resist messages attributed to the institutional media that they encounter. But they also tend to be exposed to different messages than those who trust the media. They disproportionately choose media outlets that provide information reinforcing their partisan predispositions and are less likely to choose outlets they see as politically hostile. Together, these patterns contribute to partisan differences in perceptions of reality. I recommend line plots rather than bar plots so that comparisons will be clearer. Also the graphs can be reoriented and shrunk so that all the comparisons can be seen in a single view. With so many categories I find line plots confusing and prefer the bar plots. I agree about shrinking the plots though.